Many of us who buy natural foods also grow organic gardens (or we’d like to anyway). Paul Dysinger, one of our local organic farmers is hosting a free organic gardening webinar on March 31st, and we wanted to be sure to spread the word. Paul is a great local resource with a passion for organic gardening. Watch this video for a sneak preview of what Paul will be teaching in the webinar. And click here to set up a handy email reminder and register so you don’t miss the free webinar. I live with my amazing family on Bountiful Blessings Farm in Tenenssee where we’ve been serving the community for over 14 years with fresh fruits, veggies, herbs and berries. 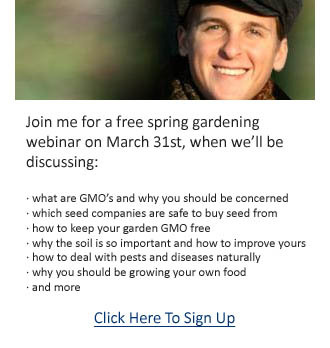 So, if you love growing robust veggies that burst in your mouth with flavor (or want to learn how without using all that chemical stuff) then join me on March 31st for a free webinar. Years ago my sister, a couple cousins of mine, and I, grew our own market garden project. It was a fun project over the summer and we were able to keep the income in exchange for breaking new ground on the farm. The farm was expanding and so we were given the new land to grow on. We never put up traps or used any pesticides or anything like that. But year after year we watched our Japanese beetle problem diminish and fade away until we hardly had any! The “secret ingredients” we added to the soil is not a secret among organic farmers. It’s simply something we’ve always done consistently every single time we plant. But make no mistake about it: What I’m about to share with you is the number one thing you can do to build a healthy garden that resists insect pests and disease. In the webinar we’ll talk more about adding organic matter, but we’ll also touch on soil structure, soil testing, and some natural things you can do if you already have a large bug infestation. Click here to set up a handy email reminder and register so you don’t miss the free webinar.